Additional Info: TV combi in master bedroom, master bedroom en suite. Please note we are only taking bookings for the weeks advertised. Thank you. Our caravan is situated on Maple Rise. It is an ABI Summer Supreme (ST David's). It has it's own parking space and a recently fitted purpose built veranda with a 6 seater table/chairs perfect for the summer evenings. It has patio doors to the front with views over the surrounding countryside. 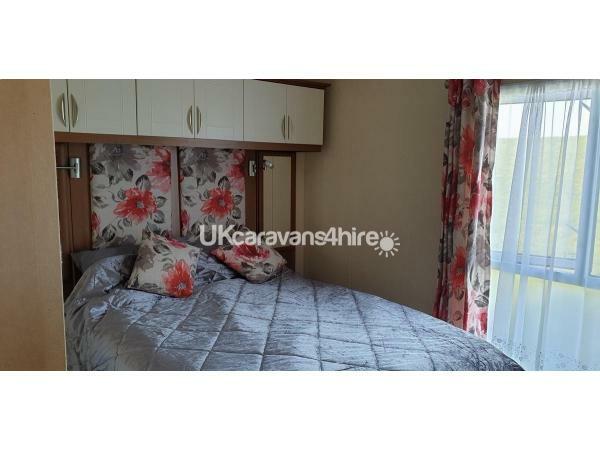 The caravan has double glazing and is central heated in all rooms. Inside the caravan is a large wrap around seating area, a 40 inch TV/DVD combi, a electric fire and separate dining table and chairs. The kitchen area is well equipped and has a full sized gas oven and extractor fan, and a full sized fridge freezer. The caravan has 3 bedrooms, the master has en suite facilities. There is also a sofa bed in the dining area. There is a fully fitted shower and toilet. If you should wish to bring your own sky card and remote a sky dish is installed. Entertainment passes are not included but can be purchased from Blue Dolphin Holiday Park reception at an extra cost.We can help you arrange to purchase your passes should you wish to do so. All beds will be made up on arrival. This is our family holiday home too so we would politely ask you to treat it with respect as you would your own.It is only rented out approx 8 times per year. A £50 bond is required and will be refunded within 14 days of departure provided the caravan is left clean and tidy with no damage or breakages. There is strictly no smoking inside the caravan and no pets allowed. A £50 non refundable deposit is required to secure your holiday date, with the balance payable within 6 weeks prior to your arrival. Payment can be made by cheque/paypal or bank transfer. There are lots of activities available on site, and also we have lots of local entertainment, pubs, restaurants things to do leaflets available in the caravan so you can plan your stay to be as busy or relaxed as you wish.